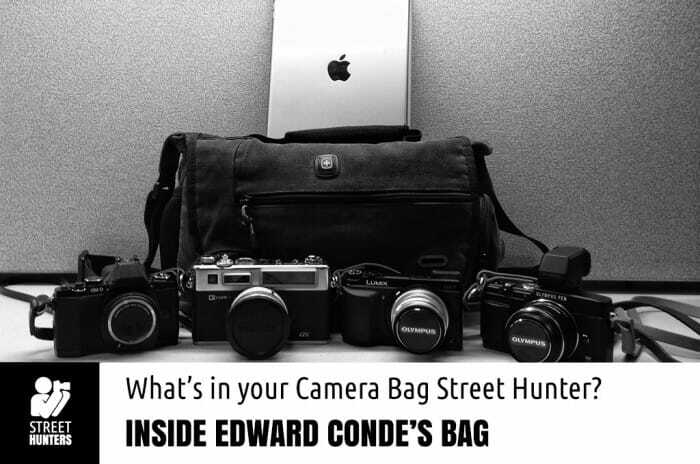 Inside Edward Conde’s Camera bag! In June 2014 we started sharing the contents of the Camera Bag of one of you, one of our awesome StreetHunters.net Readers every week! All images and text in these posts are written by the Readers presenting their camera bags. If you want to participate, please read the rules of participation at the end of the post. Here is what I carry around on my street hunts! My Yashica Electro 35 GS, OMD EM5, Panasonic GX7, Olympus Pen E-P5 & my iPad Air… My bag is just the right size to carry these bodes along with a few other gadgets for a street hunt. 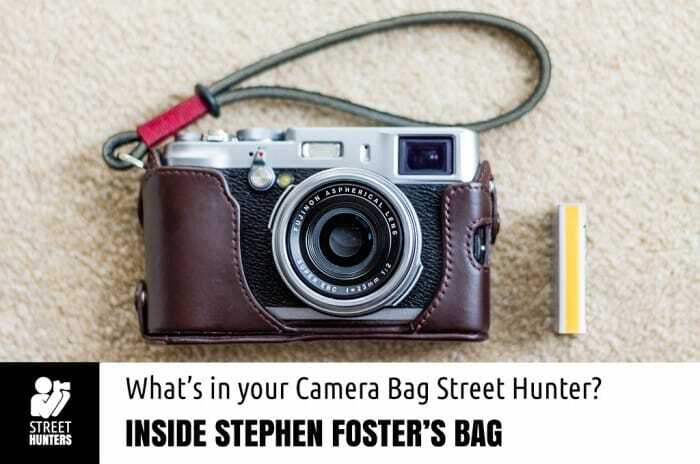 Inside Stephen Foster’s Camera bag! In June 2014 we started sharing the contents of the Camera Bag of one of you, one of our awesome StreetHunters.net Readers every week! All images and text in these posts are written by the Readers presenting their camera bags. If you want to participate, please read the rules of participation at the end of the post. Stay Sharp & Keep Shooting! Most people know me as a reasonably quick witted guy, social with some big love for street photography. But here’s a secret, a StreetHunters exclusive. Most of my life I have been a shy social introvert. I fear large groups of people. My job reenforced that personality trait to some extent early on but with the years I have overcome most of that natural tendency through my birthdays, career and family. Travelling from Newcastle to London evenings away from home left a space for a hobby. Photography came along end of last year. Bridges, buildings and churches. Then out of the blue London forced me to shoot people. I couldn’t resist its draw. Click=Panic every time. I have spent a lifetime watching people and now there was a use for it. If I could overcome the fears that are rooted in me. My camera equipment solely consists of Nikon 1. I believe this system to have a lot of potential. Hopefully, it will keep growing as I intend to continue “investing” in more lenses and cameras. I use this kit for all my photography work, not just street. Everything pictured goes into a Fossil backpack which I carry everywhere. Even in Texas heat, carrying everything is not an issue because the cameras are small and light. In the notebook I keep notes for future portrait ideas and random thoughts. The knife is used primarily as a tool. The business cards you see are double-sided, the “front” being the white side and the “back” being black side. Finally, without a watch, I will probably go insane. 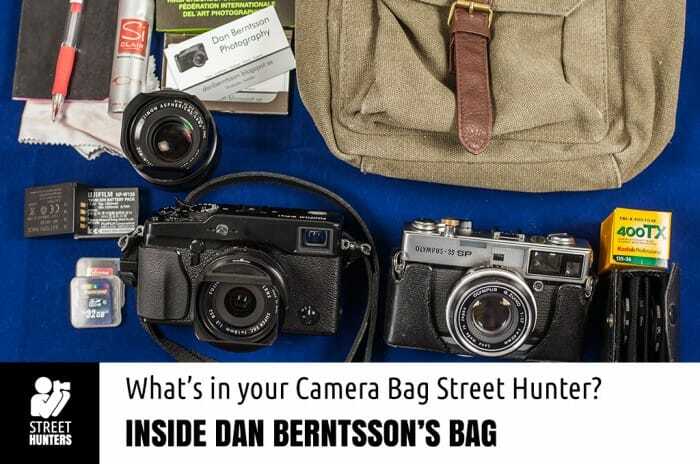 Inside Dan Berntsson’s Camera bag! 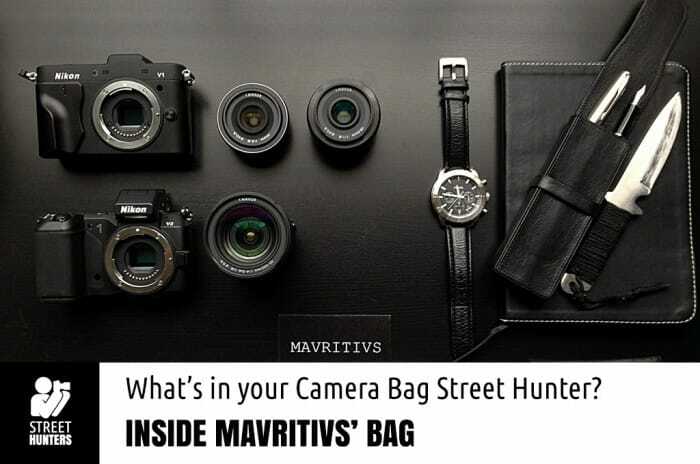 Starting today and every week (as long as we have participation) we will be sharing the contents of the Camera Bag of one of you, one of our awesome StreetHunters.net Readers! All images and text in these posts are written by the Readers presenting their camera bags. If you want to participate, please read the rules of participation at the end of the post. My name is Dan Berntsson and I am 51 years old from Sweden. I had many hobbies over the years, but I have come to realize the body cannot do everything, so now I can photograph even more. I love to take pictures of people in different situations and preferably in an urban environment. I began photographing my family, sunsets and fine landscapes with an Eos 33v and when Canon G10 came out I shoot more and more street photos. I realized that snapping people on the street was the funniest thing I’ve done. When I have been to the streets for a couple of hours I get this flow and I see everything is like a theatre, it’s a great feeling! The main thing I want with my pictures is to boost your imagination! Anything else is a failure. 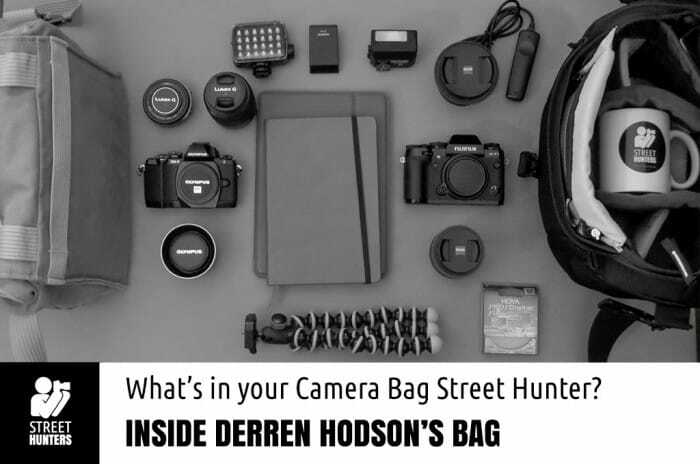 Inside Derren Hodson’s Camera bag! Photography is my hobby, I’m not a creative person, I fix things so i like things to work. My camera bags reflect this, i have two (well actually a lot of them) but two for this photo. One is my “carry all” for when I’m going out on a days shoot, the second is my “carry light” for when I get chance to take a few shots when I’m on lunch…..or with the Wife! My camera gear changes fairly frequently, not because i have G.A.S, but because I am highly critical of them as they are a tool and should do as you command, not….having to live with the ‘quirks’. I love both Olympus and Fuji (and Sigma…but that’s another story!) My Fuji gives me the quality of shot i want and the Olympus gives me the flexibility and lightness i want…..Yes my dream would be a Hybrid of both! 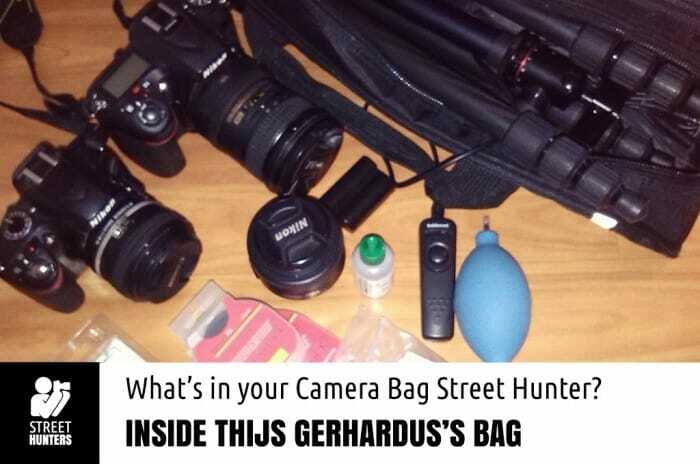 Inside Thijs Gerhardus’s Camera bag! I am Thijs Gerhardus From Alkmaar in The Netherlands, aged 39 .I work as a truck driver for the Heineken Brewery since 1998. On the road you need to see everything around you, sure helps to see things when photographing! Other hobby is Darts. Love to play it and watch the best of the world at the PDC, works better since started more serious with photography in January 2013. I got my first camera from my grandfather at the age of 12. He was a photographer and had a camera store . 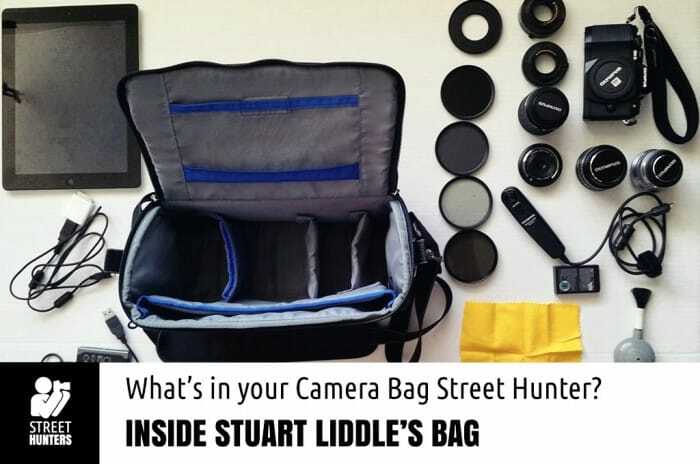 Inside Stuart Liddle’s Camera bag! I am a computer specialist in my day job but a photography nerd the rest of the time. It wasn’t until I purchased my first DSLR in 2007 (Olympus E-510) that I began to get more serious about it. I am now on my fourth digital camera, an OM-D E-M10 and my enjoyment in street photography has grown. My main goal is to have fun with photography and try to improve my skills with each image. I like the challenge of finding new ways to look at things and the ever-changing opportunities that street photography presents…it’s new and different every time I go out. Although it looks like there’s a lot in my bag, I have been known to go out with just the camera and a spare battery. My main tip would be to try to see things in a different way and, above all, have fun!